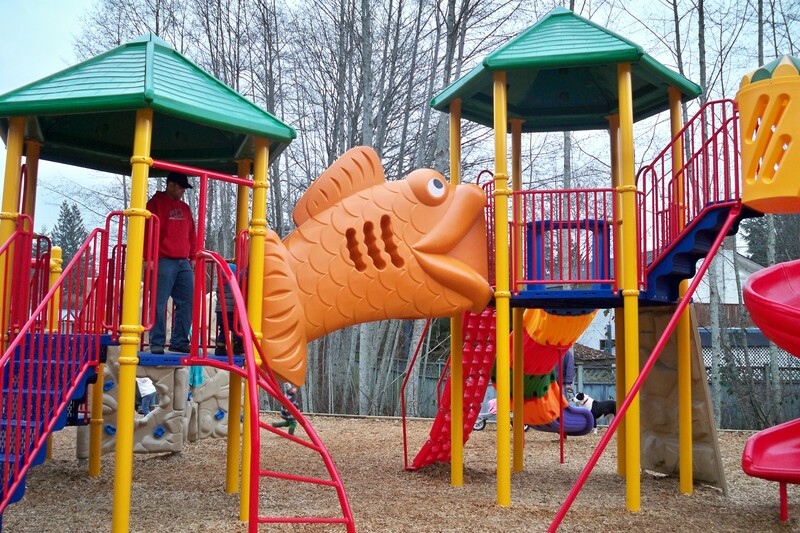 This park is more commonly known as The Fishy Park. 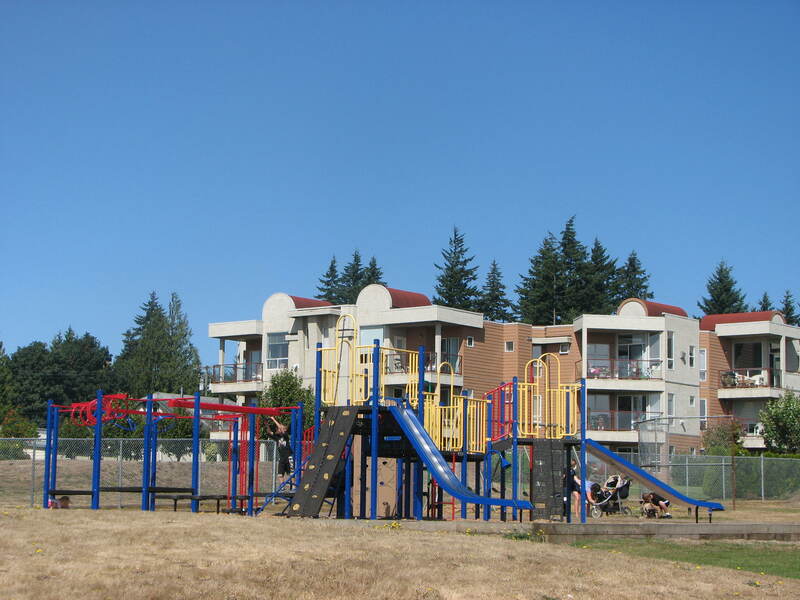 It is Sooke’s main public playground (ie: not attached to a school and therefore open to the public even during school hours), located on the corner of Pyrite and Beaton Roads. There are two swing sets offering a total of 4 big kid swings, 3 toddler swings and one special needs swing. There are two play structure areas, one older one and one newer area. The older area features a wooden structure that has various play options and one big slide. The newer area features 2 large plastic structures (with a total of 5 slides) and miscellaneous play areas between them. There are tons of play options in this area! There are also two metal diggers and 3 bouncy toys. The park features a covered picnic pavilion, a wooded area for exploring and a grassy area for running. There is parking off the street. 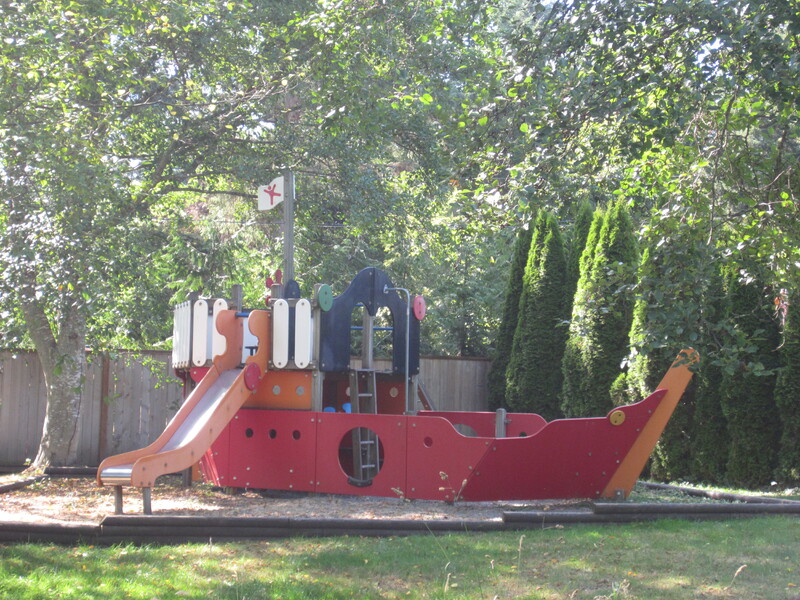 This park is commonly known as The Pirate Ship Park. It is, oddly enough, on Brooks Road. The play structure is set back from the road with grass and a pond between the road and the pirate ship. This makes it a little unnerving for those parents with kids who like to take off from the main play area, but since the play area is a giant pirate ship, why would they want to take off! The structure is bright, although somewhat faded, and has a few different play options including a slide. The pirate ship is the only thing in this park but it seems to keep the kids occupied for long enough to make the trip worth it. There is very limited street parking, but the few times we’ve visited this park we’ve been the only ones, so parking has never been an issue. This park is located on Sunriver Way, beside the Presentation Centre. It has two big kid swings, a climbing structure with a slide, and a small forest for exploring. It is a small park but a nice quiet alternative to the bigger parks in Sooke. I’m not sure where you are supposed to park to visit this playground; we’ve always gone on the weekends or evenings and just parked in the Presentation Centre parking lot. 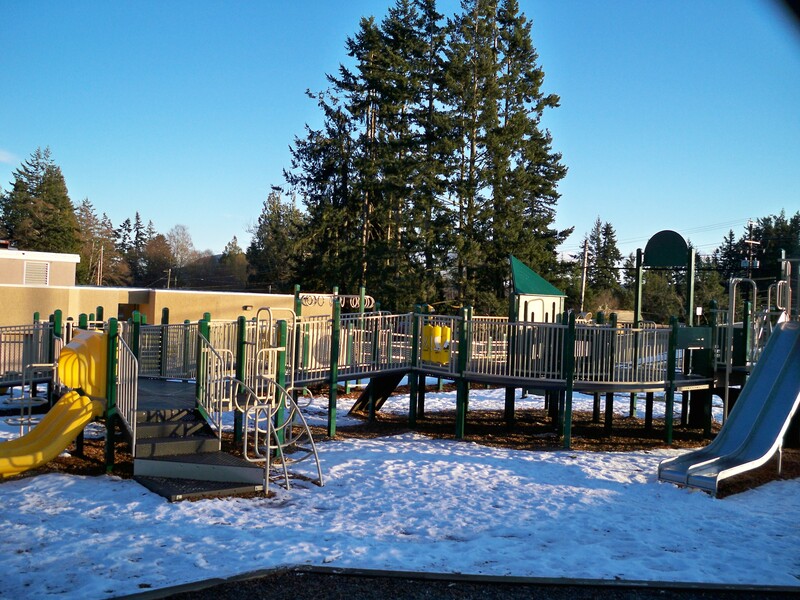 This park is located at Saseenos School on Sooke Road. It is an awesome park, very well suited to toddlers. It is made up of ramps with various spots to stop and play. There is a short double slide and another high double slide. There are also 6 big kid swings and a large field for running. There is plenty of parking off the street. This park is on school grounds and therefore not open to the public during school hours. 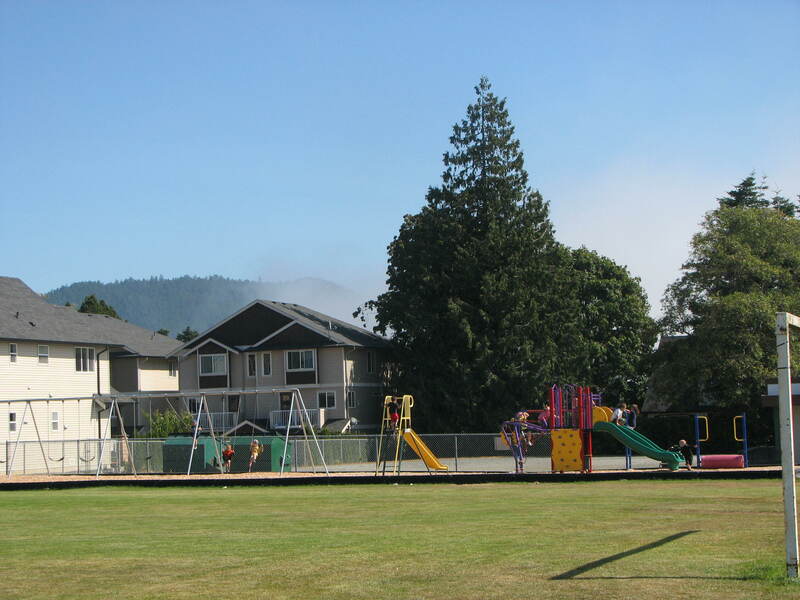 This park is located at Sooke School on Sooke Road. There are two playgrounds at this school separated by the playing field. The park closer to the road is the older portion, but it’s in great condition. It has 2 slides and various climbing features. There are also 4 big kid swings. The park behind the school features 8 big kid swings, a high single slide, a smaller play structure with a little vendor’s booth underneath the slide, stand-alone monkey bars, and a treadmill type thing (I have no clue what these are called! But they are FUN!). All of this and a huge field for the kids to burn off some energy! Parking is not an issue during non-school hours since the park is right off the school parking lot. As this is a school park it is not open to the public during school hours. Do you know if there is a new playground on Church Road? Hi Jenn, yes, it’s in the Woodland Creek development and the grand opening is tomorrow! I just posted the details on the home page. Thanks so much for the tip! There is also a playground at John Muir School at the back somewhat behind the school.